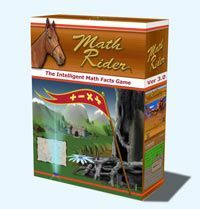 Math Rider is a math facts games that you can download to your computer. It is a complete download so you can access it without internet access once you have the program. A 'game' that really is reinforcing the basic math facts of addition, subtraction, multiplication and division. The game is designed for children ages 6-12, but I personally found it fun to see how much I knew and remembered! You really can personalize it to what ever age you need to work with. The graphics and storyline however work best with this elementary aged group of kids. I found this to be a fun way to practice math facts with some rewards and incorporating a fast paced game. My kids did struggle at first with the pace. They aren't used to having anything timed, one of the downfalls of homeschooling I think. We don't take timed tests or race to get things done as our time is more our own at home. I do think however that they need to learn to do the math facts quickly and this is a great resource for that! I used this on my 8 and 11 year old and at first they were excited about a new game. Then they quickly learned it was 'school' and weren't quite as excited. As the teacher though, I really thought this was a great game to push them in their knowledge. You can get a full 7 day trial of the game simply by submitting your email and they will send you a registration code. This would really be worth it if you think it is a game your child would enjoy, just to test it out. I love when they allow that for parents to see if it is what they are looking for. The Math Rider sells for $47 for a lifetime of updates. This allows for 8 players.